To add your name to our Ministry Update List and/or our Prayer Partners List please enter your email address below and then click on the "Go" button. People on our Ministry Update List will receive our weekly newsletter and periodic ministry updates. People on our Prayer Partners List will receive prayer requests from time to time. When professing Christians choose to make Christmas into a forum for degrading Jesus Christ and promoting a global spirituality, apostasy has reached a new level that demands an outcry. Some Anglican clergy have added a multicultural twist to Christmas decorations, adding Hindu snowmen, a Chinese dragon and a Jewish temple to the lawn where the traditional scene of a baby Jesus, angels, and the three wise men used to be displayed alone. "We've done this as it creates a good opportunity for Christians to meet and hear about the stories of people of other faiths," said the Rev. Jane Hedges, a canon of Westminster Abbey, according to U.K.'s Telegraph newspaper. "Christmas is an opportunity for everyone to stop and think and is a great opportunity of the different faiths to talk to one another," she said. "Wherever you're coming from there should be something to celebrate at Christmas." The Abbey's canon pointed out that the story of Christ's birth is included in the Koran, and noted that the Hindu snowmen is meant to convey that Hindus have something to celebrate during Christmas too. "Strictly speaking, the message of Christmas is about the birth of Christ, but it has a much broader message of peace and goodwill," said Hedges. Westminster Abbey will showcase life-size snowmen with turbans and bindi dots on their foreheads that is meant to express that Christmas is not exclusively for Christians. 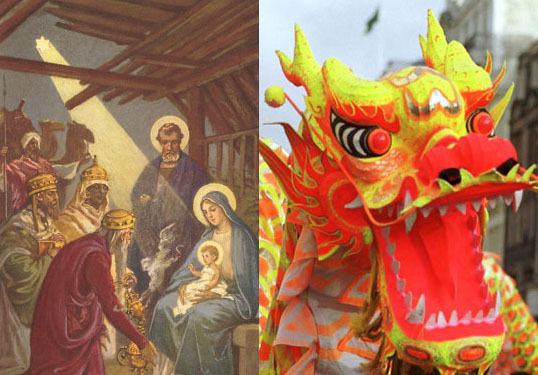 The Diocese of Liverpool, part of the Church of England, will stage a nativity that features a Chinese dragon and lantern procession. Understand The Times is an independent non-profit organization in Canada and the United States. Understand The Times is not affiliated or dependent upon any other organization or denomination. first of all, to Jesus Christ and His word.